This i have had it in a restaurant in mumbai. Of course Paneer is favourite in my home. Everytime i couldnt taken a picture of the parathas..somehow i couldnt find time to take a picture. I kept on delaying it and finally took it. Paneer mixed with capsicum, i just love this combination for a paratha. Check out the recipe below. Take a large bowl and mix together all the ingredients with enough water and make a thick dough. Knead the dough well and keep for 15 minutes. Serve hot with sabzi / curry / yogurt. Yummy parathas, Mala! I adore paneer. After all this time, I still don't manage to get such perfect circular rotis. Kudos to you! love paneer stuffing in the pararhas..addition of capsicum sounds good..
Beautifull Presentation! Parathas looks perfect! Delcious parathas.. Can imagine how it must have tasted reading the ingredient list. Just looking to those parathas i am geting hungry. Looks so yummy. Paneer parathas are my fav and these looks soo delicious....m craving for some now!!!! 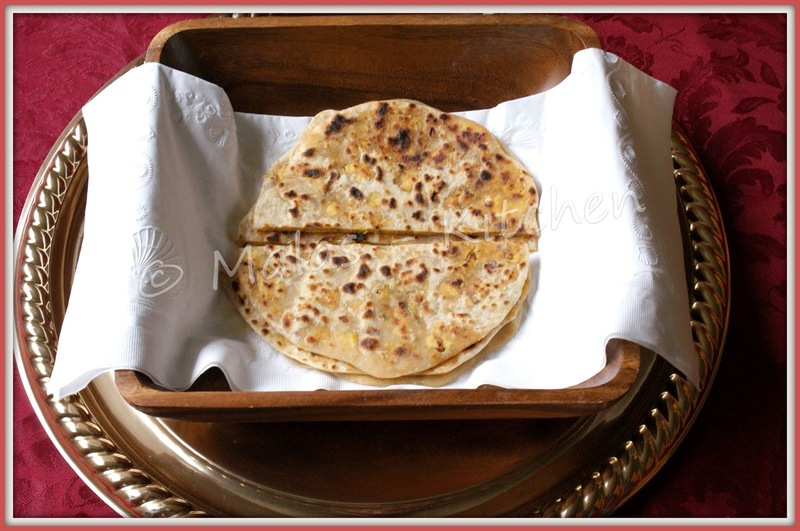 Delicious parathas Mala...i love paneer in anything...lovely dish! Parathas look perfectly cooked. Forms a healthy breakfast!